One thing we love to admire when it comes to our strategy games is depth. If a game is sophisticated with lots of subsystems that we can learn, optimize, and master, we hold it up as a shining example of the strategy genre. Sometimes, though, we forget that simple games with few systems can be every bit as fun and challenging. Interplanetary is one of those games. If you’ve ever played the classic Atari game Missile Command or seen John Connor play it in Terminator 2, then you understand the basics of Interplanetary. The game setup is simple: kill everyone on the other planets in “your” solar system. Just wholesale intrasystem annihilation, without reason or context. Personally, I’m glad there isn’t! If I had to stop and consider what it means to commit genocide on a planetary scale, then I probably wouldn’t play this game. Interplanetary is all about the pure fun of blowing things up while trying to not get blown up yourself. Game setup gives you a few options. Most of them are on by default. I highly recommend adding another zero to “Planet material” and turning on the “Cities distribute power” option. I’ve played the game without these, and it wasn’t nearly as enjoyable. Making sure your planet has 10,000,000 units of material to use in order to build weapon platforms and defense systems means you’ll never run out (and running out totally ruins the game for me). Placing buildings on your planet becomes much easier if your cities can distribute power. Once the game is set up, you’ll be instructed to build up your cities. I usually start with just five. That’s enough for hours and hours of fun without adding needless late-game micromanagement. Buildings are broken down into four categories: Resources, Intelligence, Defenses, and Weapons. Resources are infrastructure. They include buildings like power plants and mines that supply the electricity and the material you need to build and power your civilization. You’re going to want to start by building at least one power plant and one mine on your first turn. Intelligence buildings like telescopes give you information about your enemies’ planets. When you hit an enemy planet, Intelligence buildings will show you where you hit and if you hit anything of value. You might be tempted to ignore Intelligence buildings in favor of more weapons and mines like I was the first time I played. Don’t. Having them helps you end the game faster and does provide you with a more rewarding game experience overall. You don’t have to build a lot, but do make sure you take the time to build a few and then protect them. Defenses and Weapons are the exciting part of city management. Defense intercepts incoming projectiles and energy beams. Weapons are divided into two types: kinetic and energy. Kinetic weapons include railguns and missiles. A railgun is a weapon that launches a large hunk of metal out of a magnetic cannon. These weapons are “dumb” in that you can’t control where they hit. Missiles, by contrast, are “smart” weapons. When you launch a missile at an enemy planet, you can choose where on the planet it hits. So, if you have some Intelligence buildings showing you where enemy structures and cities are, missiles can help you eliminate those targets. Energy weapons are lasers. They require a direct line of sight, so if your target is facing away from your laser installation or it’s hidden behind the sun, you won’t hit it from your terrestrial energy weapons. However, there is a “Solar Laser” that shoots directly from a sun-based platform with a devastating beam. It can practically hit any planet anywhere. If your opponents get one of those, try to destroy them quickly or you won’t last long. All your buildings have to be connected to a power source. It’s is a little bit of a pain but ensures that you can’t just spam buildings everywhere on your planet. You have to think about what you’re doing and how close you want to cluster your important structures. This rule adds a little mini-game to Interplanetary that increases the fun. My only complaint is that it’s not clear why you can’t connect builds at various times. I’m not sure exactly what the rules are on this. So now that you’ve got your planet up and running, it’s time to go kill people. Interplanetary has a physics engine, so you have to be aware of planetary movements as well as gravity wells. This makes aiming tricky and infinitely more engaging. For kinetic weapons, you are given a firing arc. It’s immediately affected by your own planet’s gravity as well as the sun’s. You have to line up that arc with where you think the enemy planet is going to be by the time it arrives. Also, you have to be aware of other planets and/or space debris that is circling the sun as they also have gravity wells that can interrupt your intended flight path. It takes a little while to learn, but once you have it, it’s a blast! Energy weapons are not affected by gravity. They travel in a straight light and hit almost instantly, so planetary movement is a non-issue as well. The problem, as I mentioned previously, is that they can only aim in a straight line. Therefore, you can’t swing them around the sun to hit a planet on the backside like you can with railguns and missiles. I recommend spreading your lasers out over your planetary surface; that way you’ll always have one facing your enemies. After each salvo, you’ll receive a status update in the form of a series of icons on the right (as seen above) that tell you how you’ve done. Green icons mean you’ve hit one of your opponent’s buildings or cities. Red means you’ve been hit. They’ll also tell you if any of your shots were intercepted or if you happened to intercept any incoming threats. Once you have your Intelligence buildings up and going, you’ll be able to click on those icons and see exactly where you hit so you can better aim your weapon platforms next turn. During the game you’ll need to repair your infrastructure as your planet suffers damage. Sometimes this means rebuilding what you lost, other times you might have to redevelop in a different area. It’s generally a bad idea to rebuild in the same location where you were hit, or anywhere near that spot, actually. The enemy knows it’s a good place to target, so chances are more lasers and missiles will be heading right there in upcoming turns. Once you have a good civilization going, you’ll want to upgrade your buildings. There is a tech tree which unlocks new weapons and buildings. It’s rather straightforward though. The game also has ways to upgrade your existing buildings and weapons as well by spending material and energy. For instance, you can spend 250 Material and 100 Energy to increase the blast radius for your Rail Guns or 200 Material and 100 Energy to increase the output of a Solar Power Plant by 75%. These options add another layer of depth to the game that keeps it fresh, which is important since you’ll mainly perform the same actions over and over. Graphics for the game are a little light. As you can see from the images in this article, the developers went with more basic icons and simple images. Ordinance is dramatic to watch when coming, but not all that impressive upon impact. You know what? That doesn’t matter in the slightest to me. The fun for Interplanetary doesn’t come from flashy special effects, it comes from good old fashion gameplay and a satisfying challenge. The AI in this game was expertly programmed in my opinion. There is only one difficulty setting: default. There is no way to change it that I found in the game setup options, so you’re stuck with whatever the programmers felt was right. (EDIT: As was politely pointed out, this is actually incorrect. Please see the comments below the article for an update.) It would be simple, I think, for a computer to calculate the perfect parabola for its firing arcs every single turn. This is basic math stuff you learn in high school. The computer could test each arc a dozen times before pulling the trigger, and the player would never know it. However, the AI missed its shots just about as frequently as I did in the games I played. I felt that Interplanetary was an incredibly fair game in this regard, and I want to give credit to the developer for that. The AI gives you a chance to win, but if you blow it, it will destroy you. There isn’t much else to the game, and that’s terrific! It takes about 20-30 minutes to learn everything you need to know, and then you’ll be playing this for hours. Every time an incoming strike hits one of your cities, you’ll get angry. Every time one of your rail guns smashes an enemy building, you’ll be elated. The game takes a simple concept and turns it into a fun experience whether you’re a genocidal maniac, interstellar despot, or a typical video game player. However, that’s an aberration. Most of the time, the game is an absolute pleasure, and if you get into that situation, just start a new game! Interplanetary is so engaging that you won’t miss anything by starting a new game before your previous one ends. 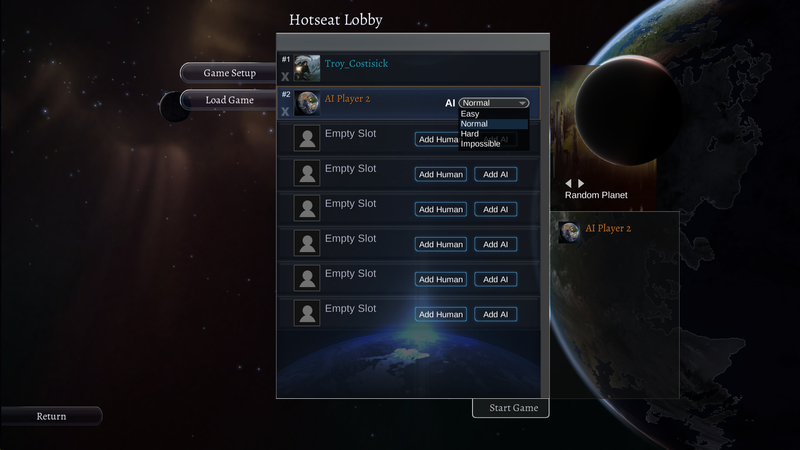 There is a multiplayer component to Interplanetary. I haven’t have a chance to test it out yet, but I have watched some videos of people playing MP matches. The game is turn-based, so it is an exercise in patience as well as strategy. It’s a fun game, so sharing it with a friend or two seems like it would be a very rewarding experience. Anyway, that’s about all there is to say about Interplanetary. It’s hours and hours of fun based on a simple premise. If you’re the type of person who doesn’t require a lot of depth or really good graphics in a strategy game, then Interplanetary is absolutely right for you. There is plenty of challenge and the game both rewards and punishes your decisions in a fair and engaging way. It’s satisfying to see something so straightforward succeed so well. I’ve had a helluva good time playing it. Troy played 12 hours on his Windows 8.1 Dell Inspiron 7000 Series 7537 BTX 17” laptop with Intel(R) Core(TM) i7-4500U CPU @ 1.80 GHz, 16GB Ram, 64 bit Operating system, x64 processor, and 2GB NVIDIA GeForce GT 750M graphics card. You say there is only one difficulty setting. I have just watched the beginning of your ‘Friday Excursion’ on Youtube, and I noticed, as you were adding AI’s in the setup that you could choose between four AI settings (Easy, Normal, Hard and Impossible). Doesn’t that represent the difficulty settings? I don’t think calculating trajectories with so many bodies is that easy, actually. You might be right, but the computer could run a dozen simulations while I’m waiting for the turn to pass and then choose the best one.